Bipolar nerve cell from the spinal ganglion of the pike. A bipolar cell is a type of neuron which has two extensions. Bipolar cells are specialized sensory neurons for the transmission of special senses. As such, they are part of the sensory pathways for smell, sight, taste, hearing and vestibular functions. Common examples are the bipolar cell of the retina, the ganglia of the vestibulocochlear nerve, and the extensive use of bipolar cells to transmit efferent (motor) signals to control muscles. The four types of retinal neurons are bipolar cells, ganglion cells, horizontal cells, and amacrine cells. Oftentimes found in the retina, bipolar cells are crucial as they serve as both direct and indirect cell pathways. The specific location of the bipolar cells allow them to facilitate the pathway of signals both where they start in the receptors as well as where they arrive at the ganglion cells. Bipolar cells in the retina are also unique as they do not fire impulses like the other cells found within the retina. Rather, bipolar cells have a receptive-field that surrounds them. Therefore, bipolar cells may exist as off-center or on-center. The off-center bipolar cells possess excitatory relationships with the synapses and are hyperpolarized by light. On-center bipolar cells have inhibitory synapses and therefore are suppressed in the dark. Bipolar neurons exist within the vestibular nerve as it is responsible for special sensory sensations including hearing, equilibrium and motion detection. The majority of the bipolar neurons belonging to the vestibular nerve exist within the vestibular ganglion with axons extending into the maculae of utricle and saccule as well as into the ampullae of the semicircular canals. Bipolar cells are also found in the spinal ganglia, when the cells are in an embryonic condition. Sometimes the extensions, also called processes, come off from opposite poles of the cell, and the cell then assumes a spindle shape; in other cells both processes emerge at the same point. 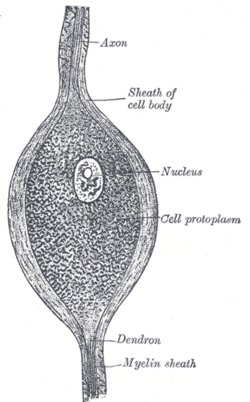 In some cases where two fibers are apparently connected with a cell, one of the fibers is really derived from an adjoining nerve cell and is passing to end in a ramification around the ganglion cell, or, again, it may be coiled helically around the nerve process which is issuing from the cell.